The following 360°videos can best be viewed in Google Chrome. Not all browsers support 360° video display yet. If you watch these on your desktop, use your mouse to look around. If you are watching the 360° videos on your mobile device, open them in the YouTube app on your mobile device and move your mobile device around to look around you in the video. The video is taken with a 360° camera mounted upside down underneath the wing. The following video is a flight in a Cessna 206 from a farm airstrip in the Karoo just west of Middleburg (Cape) to a nearby town called Graaff-Reinet to get some fuel (AVGAS) there. Have a look around and enjoy the stunning scenery. Departure from a bushstrip in the Okavango Delta called Delta Airfield. 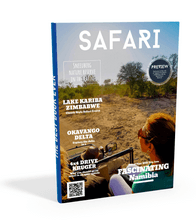 The flight was in a Cessna 182 back to Maun and onwards to the Limpopo-Lipado Private Game Reserve on the border between Botswana and South Africa. Landing on a private unpaved runway in the Kalahari Desert. The runway was just flattened and scraped by the farmer, but still not a landing strip we would include in group safaris. Great wildlife there in the Kalahari.